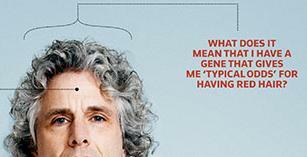 Stephen Pinker has a pretty decent article up in the New York Times called My Genome, My Self about the topic of personal genomics, i.e. getting your DNA analyzed to discover your own ‘genetic code’. For example, having a certain set of alleles (versions of a gene) guarantees that your eyes will be a particular color. You may have genes that predispose you to various diseases, or that are associated with high intelligence. The more we learn about genetics, the more subtle and fine-grained become the predictions that accompany possession of particular alleles. Some limited personal DNA profiles are now available for under $400 and people are worried that as this information becomes commonplace, it may be used against them. That is, we may find job discrimination based on genetic makeup: “Well, this candidate appears a good fit, but her profile shows a predisposition toward anger problems and a high chance of developing health problems that impair her ability to work or stay with the company.” Likewise, insurance companies may refuse to insure those with risky genes, or to make their coverage exorbitant. If someone has an allele that makes them 87% likely to develop M.S., an insurance company may deem them too risky to insure. Of course, the reality of genetics is not as simple as identifying which alleles a person has and then knowing how they will turn out. Sure, some things are determined strictly by which version you have of a particular gene: if you have a particular defective gene, you are guaranteed to develop Huntington’s disease eventually. But other genes — almost certainly the majority of them — are more complicated than that. We don’t know exactly how they interact with other genes, or how they interact with the environment (epigenetics), and at best we can attach probability estimates to the outcome of having a particular allele. If 85% of the people with allele X for a given gene end up developing cancer, and 15% with that allele don’t, then we might conclude that the gene is involved in that cancer. [T]here is nothing like perusing your genetic data to drive home its limitations as a source of insight into yourself. What should I make of the nonsensical news that I am “probably light-skinned” but have a “twofold risk of baldness”? These diagnoses, of course, are simply peeled off the data in a study: 40 percent of men with the C version of the rs2180439 SNP are bald, compared with 80 percent of men with the T version, and I have the T. But something strange happens when you take a number representing the proportion of people in a sample and apply it to a single individual. The first use of the number is perfectly respectable as an input into a policy that will optimize the costs and benefits of treating a large similar group in a particular way. But the second use of the number is just plain weird. Anyone who knows me can confirm that I’m not 80 percent bald, or even 80 percent likely to be bald; I’m 100 percent likely not to be bald. The most charitable interpretation of the number when applied to me is, “If you knew nothing else about me, your subjective confidence that I am bald, on a scale of 0 to 10, should be 8.” But that is a statement about your mental state, not my physical one. If you learned more clues about me (like seeing photographs of my father and grandfathers), that number would change, while not a hair on my head would be different. Some mathematicians say that “the probability of a single event” is a meaningless concept. As long we are stuck with just population-level data about trends in the population that have that allele, we can’t easily apply it to predict an individual outcome with any certainty. Because of the myriad influences that go into your personal equation, it is often nearly impossible to know how someone will turn out. You can attribute the ability to defy our genotypes to free will, whatever that means, but you can also attribute it to the fact that in a hundred-trillion-synapse human brain, any single influence can be outweighed by the product of all of the others. For all the narcissistic pleasure that comes from poring over clues to my inner makeup, I soon realized that I was using my knowledge of myself to make sense of the genetic readout, not the other way around. My novelty-seeking gene, for example, has been associated with a cluster of traits that includes impulsivity. But I don’t think I’m particularly impulsive, so I interpret the gene as the cause of my openness to experience. We are susceptible to cognitive errors like confirmation bias that make us likely to interpret what we see in order to fit our preconceived notions. In this case, if we are told our genes predispose us to be or act a certain way, we may in turn take extra notice of the cases where this applies and take less notice of the times where it doesn’t. Or it may lead to self-fulfilling prophecies: if I’m told that I am predisposed to depression, will I be less likely to bother attempting to cope with depression because it’s just in the cards for me? But he seems to be ignoring exactly the point he took so much pain to clarify. Yes, we may not be able to use our genes to easily predict or interpret our individual character traits, but the data *do* tell us something about aggregate chances in the population. Which means it is perfectly useful information when, say, companies have access to many different individuals. “Sure,” a hiring manager might muse, “you could be in the 15% of people with allele X that don’t develop problems, but it is simply cost-effective for us to just not risk it and instead choose people with allele Y.” In other words, the data that summarizes population-level trends is perfectly applicable to those who can apply it to a large group, and not worry about the chaos that determines a single individual’s outcome. Insurance companies will be the first in line to use such information against us, given the chance, because it makes perfect sense. That is not to rage against the inevitable technological developments of the future: personal genomics is here to stay. But we should remain on guard against the potential downsides of having this information widely available, and especially against inappropriate or unfair applications of that information to discriminate. The differences in our genes may be a source of inherent unfairness in the first place (being beautiful or tall may make you more popular, more likely to get hired, better paid, etc. ), but further amplifying that effect by rewarding those blessed with lucky genes and punishing those not so blessed is contrary to the egalitarian spirit of equal opportunity. Perhaps the more this happens, the more pressure there will be toward increasing use of gene therapy and modern eugenics (as I wrote about here). The future will no doubt look vastly different. Meanwhile, here in the present, we will just have to deal with the inequalities. And likewise, we may soon face our own existential crises in investigating our genomes, if personal genomics enters the family doctor’s office on the cheap. As Pinker mentions, variants of the ApoE gene imply a many-fold increase in the risk of developing Alzheimers (again, this is summarizing population data — it may be that looking at other genes tells you whether you’ll be one of the people with that ApoE variant that develops Alzheimers or one of those that does not). Pinker decided not to find out which version of that gene he had, which brings up an interesting question: would you want to know? People are no doubt bad predictors of how they would handle such news (Pinker mentions in passing some preliminary evidence that people handle the news okay), but it’s interesting to consider how you personally would handle that choice. More banally, in what ways would knowing you were predisposed to certain behavioral traits (risk-taking, or neurosis, or neophobia, or depression) influence how you perceive yourself and interprete your own behavior? Are people naturally genetic fatalists, even if the information they are given is merely probabilistic? It would be interesting to systematically study how people handle such information (personality, as opposed to just medical risks), if such work hasn’t already been done. This entry was posted in Uncategorized and tagged privacy, science, statistics. Bookmark the permalink. Good find! I posted about your post here: http://www.philosophistry.com/archives/2009/01/personal_genomics_and_the_nuances_of_communicating_statistics.html. I couldn’t get the TrackBack to work on your post.